As with the cleanup of contaminated sediment, a wide array of remedial approaches may be used to address contamination in low-lying, or floodplain, soil. These include excavation of contaminated soil; access, activity and use restrictions; and advisories limiting or eliminating consumption of fish and wildlife. EPA approved a range of clean-up options for evaluation by GE for the Housatonic floodplain soil, ranging from no action to extensive removal of soil by land-based equipment, followed by placement of clean soil and replanting of vegetation. 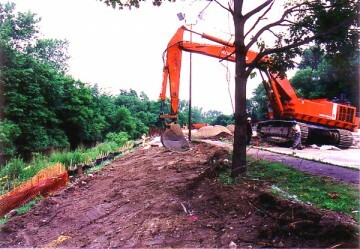 Conventional earth-moving equipment may be used to remove soil containing contaminants. These areas are then typically backfilled with clean soil and new plantings to restore habitat. Excavation and replacement may cause significant adverse impacts to existing ecological habitats and wildlife, as well as the beauty of the natural environment. Additional habitat may be affected by construction of processing, treatment and transportation facilities needed to support the project. As approved by EPA, GE evaluated seven clean-up approaches for addressing PCBs in Housatonic floodplain soil. Six of these options included removal of 17,000 cubic yards to 570,000 cubic yards of soil, covering 11 acres to 350 acres, respectively. Clean soil would then be placed in the excavated areas. In areas that are not frequently used, institutional controls, such as fences or signs, may be installed to inform the public about the presence of contamination and warn them not to come into contact with the soil. In addition, deeds of shoreline properties may be modified to restrict certain property uses or activities, such as digging in soil, to reduce the potential for exposure to PCBs. Warning signs may be posted to inform the public to avoid or limit consumption of fish and certain biota found in the river and floodplain. Similar advisories may be established for agricultural products grown in floodplain soil.